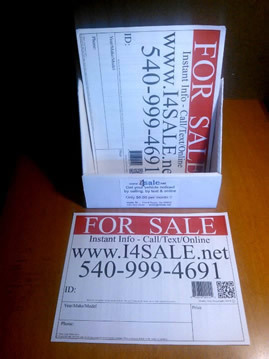 When you sell our signs at your location, we supply you with a free counter top display or use your own rack. We then add your business to our web site as a point of sale for the signs only, driving customers to your location. You can also offer discounts on your products or services to anyone that visits our web site.
? 2015 I4SALE. LLC. All Rights Reserved.